Grabs you at the first page and doesn’t let go!! 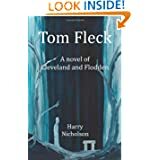 Tom Fleck is a young man with an adult’s load of responsibility resting on his shoulders. The weak don’t last long in the early sixteenth century. Life could be as short as it was cruel. But Tom is not one to complain. He works hard every day and does what he can to take care of himself and his sister. Though life is difficult, Tom still dreams of one day falling in love and having a family and farm of his own one day. A found Tudor ring may end up being the answer to all Tom’s prayers, but only if he can find a way to stay alive long enough to get there. In hopes of a large reward, he sets out on a journey to return the ring to its rightful owner. After making arrangements for his sister to be taken care of, Tom begins his journey with his faithful dog Meg close at his side. He doesn’t plan to get tangled up in the war, but his talent with the bow is noticed and before he knows what happened he and Meg are caught up in a battle he doesn’t expect to walk out of. Harry Nickolson’s talent in my opinion is his way of bringing the people and land to full 3D life. I didn’t so much read a story about Tom Fleck as I did live it with him. Tapping into the emotions of a reader is what most authors try for but only a select few succeed in. Sights and smells were described so well that I felt like I was walking the countryside right along beside Tom and Meg. My stomach churns as the tension level rises and Tom and Meg look death in the face on a blood-soaked battlefield. One couldn’t help but worry for his dog during all the chaos, but the reader isn’t the only one. Hardened men looking death in the face do what they can to help watch out for her. Pain and fear are real, enough so that one can smell the blood and death heavy in the air. But even through the horrors he is faced with, Tom never loses his dream of returning home with the woman he loves by his side and starting a family. Even the best of novels often have parts that will strike a sour note with me, but Tom Fleck isn’t one of them. I highly recommend it, especially for those who enjoy historical fiction. The story will not disappoint as it draws you into a time, land and its people through Tom, Meg and the interesting characters they meet along the way. It takes hold from the start and doesn’t let go till you turn that last page. Definitely earns its five star rating. Posted by Denna Holm on February 24, 2012 in Archives and tagged best seller, dogs, five stars, novel, realistic, sixteenth century, tension level. Hello, Denna. I’ve called by to thank you for the comprehensive review of ‘Tom Fleck’. It cheers up this dull February day – in fact, outside, a few song birds have begun to tune up. What a great story! I’m afraid my review doesn’t do it justice. I can’t wait to read the next one! !